Aster schreberi.USDA-NRCS PLANTS Database / Britton, N.L., and A. Brown. 1913. An illustrated flora of the northern United States, Canada and the British Possessions. 3 vols. Charles Scribner’s Sons, New York. Vol. 3: 411. (Accessed 7/2014). Eurybia schreberi is a perennial herb 20-120 cm tall, like Aster macrophyllus but inflorescence stems not glandular. 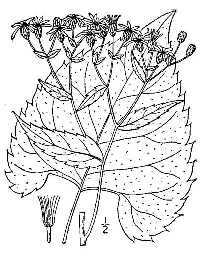 Leaves: sinus at leaf base rather rectangular. Flowers: ray flowers white, 6-14, bracteate base of flower head 0.5-1 cm long, usually narrower than A. macrophyllus. Frequency in NYC: Very infrequent. Rare (NYS S2 U).